The annual lantern parade is back again this year on the 20th December 2016 starting at the Amesbury History Centre 4:45pm. As usual the route will take the procession through the beautiful grounds of the Amesbury Abbey where we will stop for mince pies and mulled wine before making our way to the ancient spring where the solstice lantern will be waiting for us and our resident druid Frank Somners will perform a service. The fading solstice light at Stonehenge is taken and put into the solstice lantern which is kept alight all night to light the darkest night and then taken back to the stones the next morning to extinguish. This is a tradition that started a few years ago and has grown in popularity year on year. 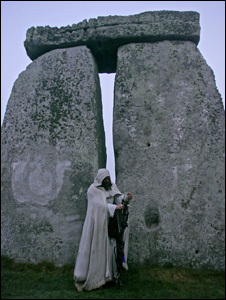 Follow us on Twitter and Facebook and for all the latest Stonehenge news and Winter Solstice updates. The remains, found at Larkhill and Bulford, were unearthed during excavations being carried out before the building of a series of brand new Army houses. At Larkhill, the discovery of a Neolithic causewayed enclosure – a major ceremonial gathering place some 200 meters in diameter – dating from around 3650 BC radically changes our view of the Stonehenge landscape. About 70 enclosures of this type are known across the UK, although this is only the second discovery in the Stonehenge landscape, with the other further to the northwest at Robin Hood’s Ball on the Salisbury Plain Training Area. In the Wessex region they occur on hilltops and, along with long barrows, are some of the earliest built structures in the British landscape. The Larkhill enclosure has produced pottery, worked flint, a saddle quern, animal bone and human skull fragments, all placed in the ditches which define the enclosure. Sites of this type were used for temporary settlement, to exchange animals and other goods, for feasting and other ritual activity, including the disposal of the dead. The objects found in the ditches reflect these ceremonial practices. The Larkhill causewayed enclosure is around 700 years older than Stonehenge and is part of a landscape that included other large earth and timber structures such as long barrows and cursus monuments. Its builders shaped the landscape into which the stone circle at Stonehenge was placed, which was already special long before Stonehenge was constructed. The causewayed enclosure at Larkhill shows that they had the social organisation necessary to come together to create significant earthworks, and the resources to support the work, as well as the people to carry it out. While part of the site has been investigated, the majority of it lies within the Larkhill Garrison, where it remains unaffected by the current works. At nearby Bulford, archaeologists have found a unique double henge, the only example known in Britain. The earliest phases were created around 2900 BC with circular enclosures formed by ditches dug in segments with openings to the north. In the Early Bronze Age (around 2000 BC) both henges were enclosed within continuous ditches, and perhaps buried beneath barrow mounds. From one of the Bulford henges a skull from a large dog or wolf, perhaps a working companion, a trophy from the hunt, or even a totemic symbol, was recovered. Archaeological work on both sites is being managed and directed by WYG on behalf of Defence Infrastructure Organisation (DIO), with fieldwork undertaken by Wessex Archaeology. The sites’ development is part of wider plans to accommodate the 4000 additional Service personnel plus their families who will be based on and around Salisbury Plain by 2019 under the Army Basing Programme. In total, the MOD is planning to invest more than £1 billion in the area which will provide more than 900 new homes for Service families, over 2,600 new bed spaces for single soldiers and the construction, conversion or refurbishment of 250 other buildings within bases, such as offices, garages, workshops and Mess facilities. Stonehenge closes to visitors at the usual time of 5pm on Tuesday 20th December ahead of the annual Winter Solstice celebrations on the morning of Wednesday 21st December. The last timed-ticket admission for pre-booked groups is the usual time of 3pm, providing a 2-hour window for groups arriving at this time to view the monument and enjoy the exhibition and other facilities in the visitor centre. All coaches and minibuses and their passengers must be off-site by 5pm as usual. Stonehenge re-opens to visitors from 11.30am on Wednesday 21 December. Parking for coaches and minibuses bringing visitors for the Winter Solstice will cost £50 per vehicle and is provided from 6am until 10am in the Stonehenge Coach Park. Coach and minibus parking for Winter Solstice is limited and tour operators and group travel organisers should contact the Stonehenge Bookings Team from today to book coach or minibus parking. Booking is essential. There will be a number of temporary road closures in the local area. There will be no access to Byway 12 throughout the Winter Solstice access period. Access to Stonehenge for solstice is subject to the Conditions of Entry which we would ask tour operators, group leaders and drivers to ensure their group members are aware of and adhere to. Stonehenge is in a field in the middle of Salisbury Plain and the weather in December will be cold and wet. Even if it isn’t raining, the ground will be wet from the dew. There may also be frost. Sensible footwear and warm, waterproof clothing are essential. There is at least a 30 minute walk (in low light or darkness), from the coach park to the monument. Visitors are therefore strongly advised to wear strong, waterproof footwear and bring a torch with you. Toilets at the monument field will only be available once the access period begins. There are no catering facilities in the monument field, however the café at the visitor centre is open for hot drinks and breakfast rolls from 6am. On Wednesday 21 December, sunrise is at 8.09am. The monument field will open at approximately 7.45am, depending on light levels and will close at 10am. Stonehenge re-opens to day visitors from 11.30am on Wednesday 21st December. Follow us on Twitter , Facebook and Periscope broadcast for all the latest Stonehenge news and Winter Solstice updates. Gain a rare and fascinating insight into the famous World Heritage Site with an exclusive tour around the site led by one of English Heritage’s experts. Start the tour with exclusive early morning access to the stone circle at Stonehenge accompanied by our expert. Followed by a light breakfast we will then visit key archaeology sites including Durrington Walls, Woodhenge and The Cursus and learn more about the archaeological landscape and investigative work that has taken place in recent years. A light breakfast is included. This event has been graded as moderate as there will be plenty of walking over uneven ground. Please dress for the weather as there is no shelter on site. Sturdy footwear is a must, as is a torch. Tickets are available now by calling English Heritage direct on 0370 333 1183. English Heritage is celebrating 30 years of World Heritage Site status for Stonehenge this weekend. To launch the 30th Anniversary celebrations, students from local Stonehenge School and Avon Valley College are today unveiling a special plaque highlighting the World Heritage Site status of the iconic Wiltshire monument. n 1986 Stonehenge and Avebury were among the first seven sites in the UK to be inscribed on the UNESCO World Heritage List. World Heritage Site status gives Stonehenge and Avebury international recognition alongside sites such the Egyptian Pyramids, the Great Wall of China and the Galapagos Islands as a place of exceptional importance to all humanity. I am really pleased to be asked to help unveil the plaque at Stonehenge. World Heritage status is important because it means that a place is valuable to everyone, from all over the world and we must all look after it well so that everyone in the future can enjoy and understand it too. On 19th and 20th November, 30 Goody Bags will be given out at random; 30 Golden Tickets will be hidden around the site and every visitor will receive a special souvenir postcard. “This year we are celebrating thirty years of World Heritage status and we are excited to be joined by local schools as part of the Kids Takeover day, as we unveil a World Heritage Site plaque and launch our special 30th Anniversary weekend. A second levelling survey was carried out in 1912-21 and the datum was changed to MSL at Newlyn in Cornwall. In the 1950s a third survey was performed, still making use of the Newlyn datum. The OS benchmarks at Stonehenge are in the traditional form of three lines / | \ beneath a horizontal bar which is the indicator of the reference height above the datum’s MSL at that spot. Coincidentally, this is a similar form to that of the Druidic “Awen” emblem which also uses three lines / | \ but positioned below three dots rather than a horizontal bar. See https://en.wikipedia.org/wiki/Awen for the history and an explanation of this symbol. At Stonehenge two of the benchmarks are on the Heel Stone and one is on Stone 16. Stone 16 is the tooth-like stone at the southwest side of the monument directly behind the tallest stone on the site, and the benchmark is low down on the left of the southeast face. This references the Newlyn datum, is 103.114m above MSL and was last verified in 1957. The Heel Stone is the massive leaning stone some 80m northeast of the stone circle which famously (but only roughly) indicates the position where the sun appears on the horizon at the summer solstice as seen from the centre of the stone circle. The upper one references the original Liverpool datum, is 101.346m above MSL and was last verified in 1900. The lower one references the Newlyn datum, is 100.7m above MSL and was last verified in 1957. From the Newlyn benchmarks, you can work out that there’s a drop of 2.414m from the one on Stone 16 to the one on the Heel Stone. None of these benchmarks are visible from any of the visitor paths around the monument, although if the light is right (early morning or evening in summer) the upper one on the Heel Stone can just be made out from the National Trust field. To see them properly you’ll need to come to one of the Managed Open Accesses at the solstices or equinoxes. Alternatively, you can book a private Stone Circle Access visit which take place most days of the year before and after regular opening times.